Works great on iOS 11! 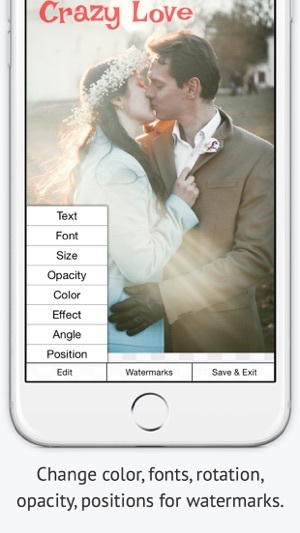 The essential Watermarking App for Professionals, Business and Personal Use. 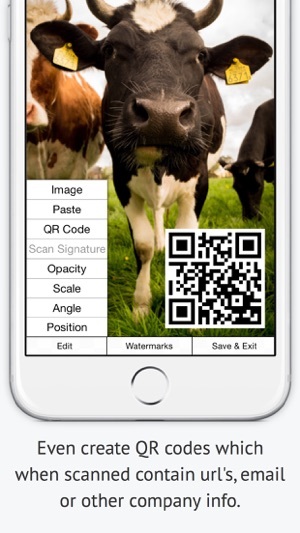 Easily, secure and protect your photos with a text, graphic, signature or QR watermark. Once added to a photo this visible watermark displays it is created and owned by you. Watermarking is increasingly important and is like signing your name to a photo. A watermark subtly displays, no matter where your photo goes, that it's yours. Watermarking can also be used to add your email, url, a personal message or fun graphics to any photo or Pokemon Go screenshot. Before you download please be aware this lite version allows using all features but also adds our small watermark ('Created by iWatermark') to remove this upgrade to iWatermark (which has no additional watermark). 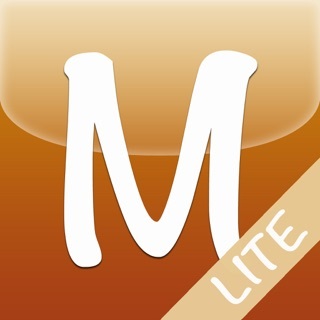 Many find the lite version fulfills there needs but we recommend upgrading. 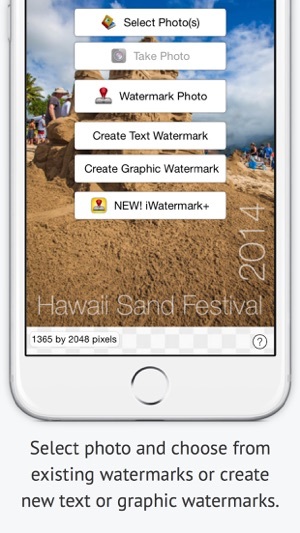 This supports the evolution of iWatermark, its a small price for such a sophisticated program. 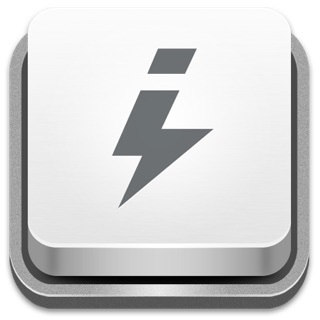 Thanks to all iWatermark users for the great reviews and suggestions. 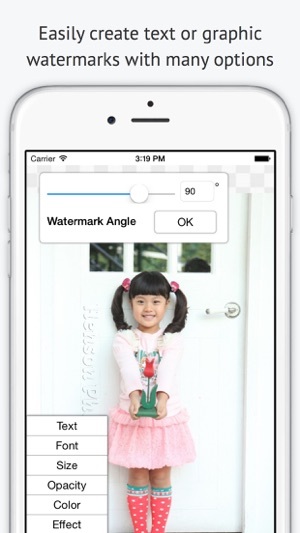 iWatermark, is the only watermarking tool available for all 4 OS platforms and the most popular professional watermarking tool for photos. 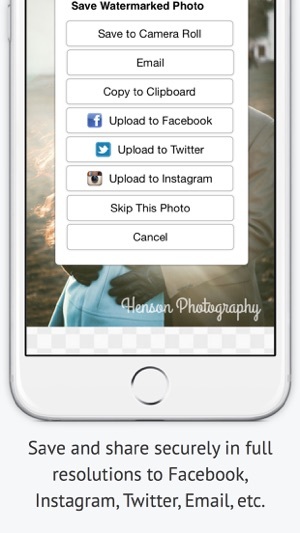 Social media sharing via full resolution to Facebook, Flickr, Instagram, Twitter, Camera Album, Clipboard or Email (3 resolution options). Q:I want to use my signature as my watermark. How do I add my graphic signature like the examples by Picasso, Ben Franklin, etc.? 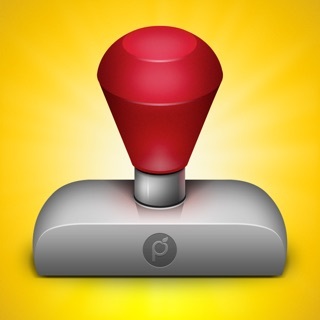 A:Use our signature tool or make the .png graphics on your computer, email it to yourself, open the email on your device and save to your photo album. In iWatermark create a graphic watermark and choose the graphic from your photo album to add it as a new watermark. Contact us for help or with suggestions. I figured the free version would only allow a certain number of test photos or not allow you to mark batches of photos but nope. They put a gigantic, ugly watermark of their own on your photo, as if ANYONE can use it then. Nice job making this app useless. I don't even want to give you people money for the full version because of this so I'll be finding another method. Thanks for nothing. This version is simply to allow people to test full functionality before they buy. Unfortunately the app store does not provide a way to do shareware. Thanks. I like this app but the fact that it is not free for you to just use it without having to buy a full version wastes time. The made with IWatermark creates a whole list of liability issues as to who owns the photo now. You need to remove the “made with” logo because I will not crop my photos for your waste of resources. 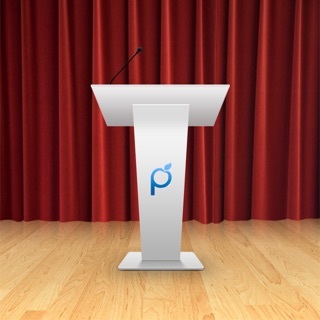 The app leaves a huge message at the bottom of your picture saying this is the free version. pretty much defeating and destroying the whole purpose of the app. There are other apps available on here that don't #DO that so don't give up just search for Em.